Honored Kid Sully loves to bike, run and wrestle with his brothers like any 11-year-old boy. He even tried out skiing over spring break. You’d never expect that just a year and a half ago, Sully woke up from surgery unable to walk. Honored Kid Sully loves to bike, run, ride roller coasters and play with his brothers, Cashel and Finn. He wants to be a civil engineer when he grows up and dreams of designing the world’s best roller coasters. It all started with back pain. It was innocuous at first. Hot baths would relieve Sully’s pain for a while, but it would come back with a vengeance. Finally, after many doctor’s visits, a lot of ibuprofen and no improvement, Sully’s parents, Dan and Jen, brought their son to the ER. Hours later, the boy was in emergency brain surgery. 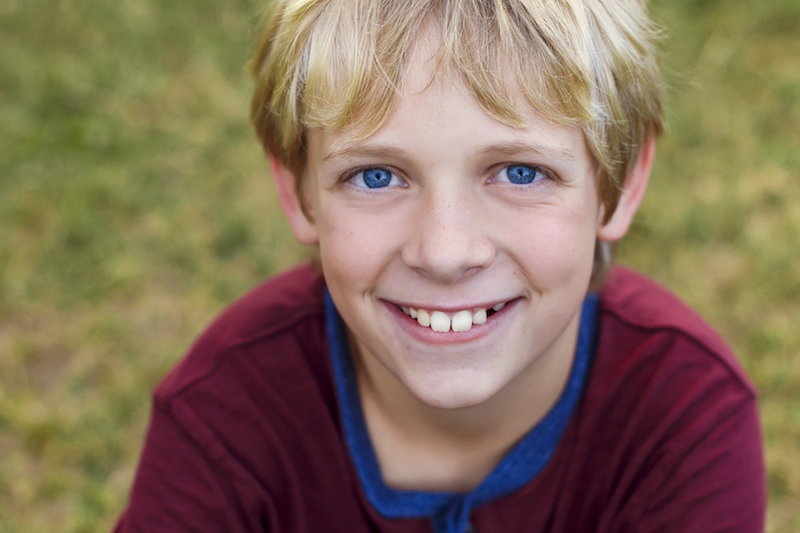 Sully was diagnosed with medulloblastoma, the most common malignant brain tumor found in kids, and it was aggressive – so aggressive that it had grown and spread to Sully’s spine within weeks. Sully had to stay very still during his radiation treatments. If he moved the slightest bit, the technicians needed to turn off the machines and reposition him, he said. Sully listened to Harry Potter audiobooks to stay occupied during the 45-minute treatments. And there was a lot more treatment to do. 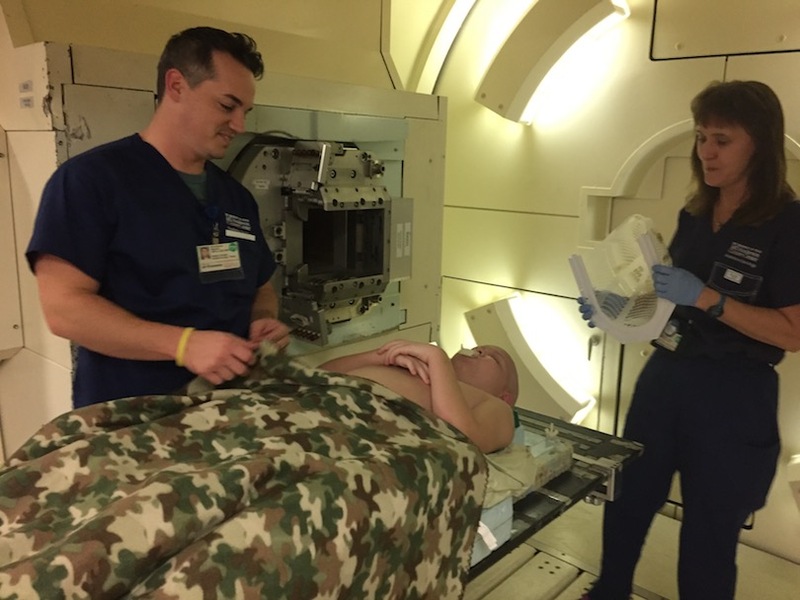 Sully endured 30 rounds of intense brain and spine radiation, and chemotherapy that made the boy so sick that he preferred to be asleep to endure the first powerful doses. 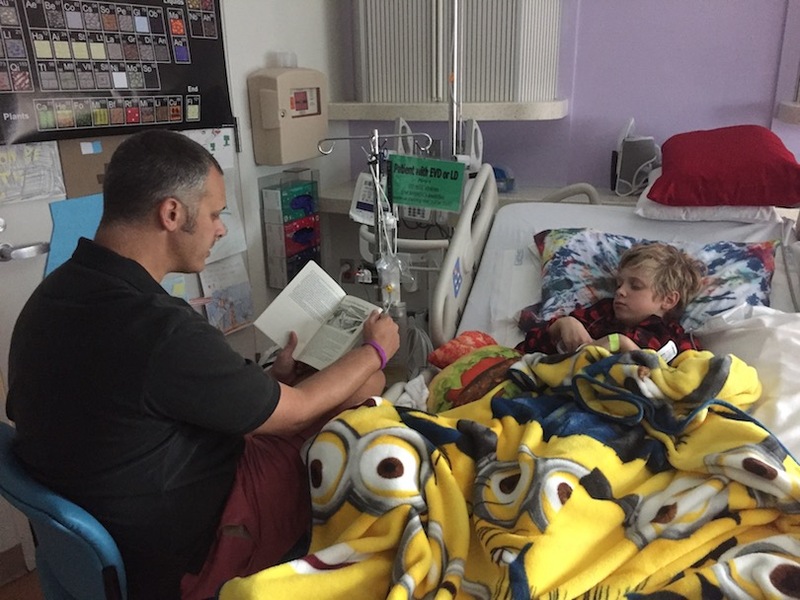 Dan reads to Sullivan during his chemotherapy treatment. Beyond the treatment for his brain cancer, there was another big hurdle. When Sully woke up from surgery, he had trouble speaking. He was quick to anger and one of his eyes had drifted off course. But most disturbing of all, the boy couldn’t balance long enough to stand up or walk. Sully’s surgery had caused posterior fossa syndrome, which can occur after surgery to the lower portion of the back of the brain, which contains the brainstem and the cerebellum. Disturbances in speech, emotional regulation and balance are some of the symptoms, and these can take months to years to subside. 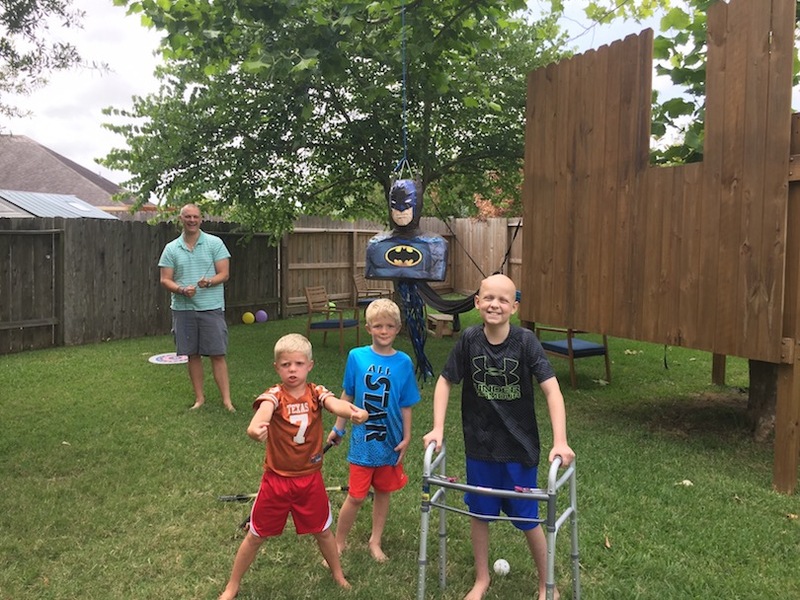 Sully goofs around with his siblings and a Batman pinata during his treatment. But Sully had no doubts that he would beat it sooner rather than later. He did what he does best – he put his nose to the grindstone. He worked and he worked hard. He dedicated himself to his stretches and exercises, and worked with a physical therapist in between visits to the hospital for more chemotherapy treatments. He set goals and worked toward them, like learning how to get into the car again and climb into the bathtub. Supported by his physical therapist, Sully works hard to regain his ability to stand up. And one day in December 2016, not long after his surgery, Sully’s hard work paid off. 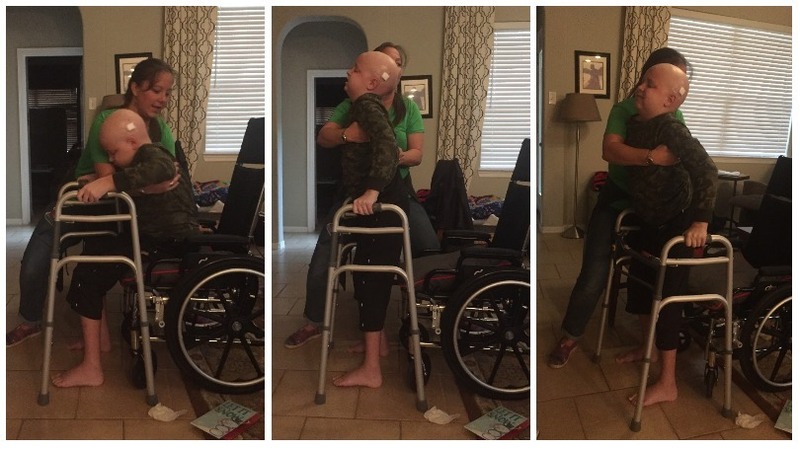 He was sitting in the living room of his house when the physical therapist placed his walker in front of him. Sully grasped the handles and mustered every bit of determination. “I pushed hard,” Sully said. He locked his knees and stood up. Then everyone started crying happy tears. Sully smiles with his medal after finishing a triathlon weeks before he was diagnosed with brain cancer. This summer, Sully is competing in a kids’ triathlon. 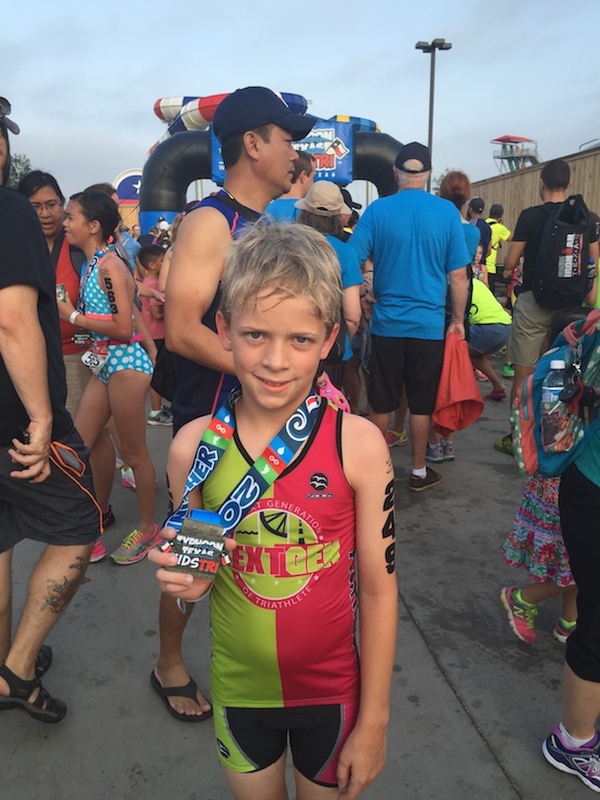 He’ll swim for 200 meters, bike two miles and then run one mile along a course on Galveston Island, Texas. 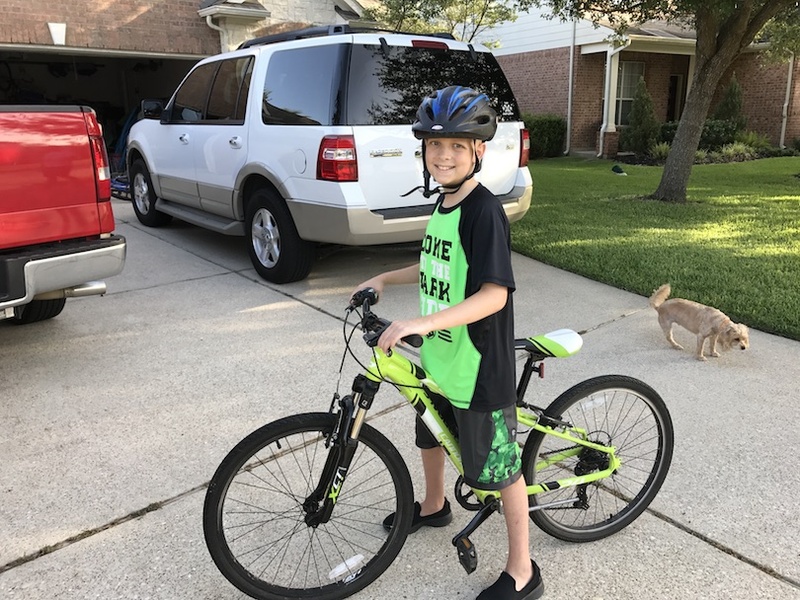 Just weeks before his diagnosis, Sully competed in this triathlon and now, this September – Childhood Cancer Awareness Month – he’ll be returning to conquer it again. “I firmly believe he would not be where he is today if he wasn’t the kid that he is,” Dan said. But unlike a triathlon, the childhood cancer journey doesn’t have a finish line. For Sully and many kids with cancer, ringing that bell at the end of treatment doesn’t necessarily mean that the war is won. Sully’s endocrine system is damaged, he has high-frequency hearing loss and his memory isn’t what it used to be. Because of cancer and the harsh treatment, he will face challenges for the rest of his life. Sully rides his bike — an activity some of his doctors thought he’d never enjoy again. But so far, Sully has won some big battles. Time and time again, he’s has come out on top and he wants the same for other kids with cancer. More than that, he wants them to actually cross a finish line. That’s why he and his family are involved in St. Baldrick’s through their head-shaving team, Sullivan’s Fight. That’s why Sully wants to inspire people to fund childhood cancer research. He wants cures. “We want to find better ways to treat this cancer, so kids in the future don’t have to go through what I went through,” he said. Fund the search for childhood cancer cures today and make Sullivan’s dream a reality.